I definitely remember the owl craze of the 1970's. I remember using it to cover a metal circuit breaker box. It was handy for that. Owls are back. They are in catalogs, in stores, on blogs, and on Pinterest. I remember thinking, "why owls again"? I think if I came across an owl in the woods, it would kind of scare me. They have been known to pick up dogs and cats and kill them. But for some reason, I purchased this primitive cloth owl at a local floral and gift shop. This owl looked harmless enough, actually kind of cute. Here is "Baby Hoot" in my fall suitcase vignette. I think I paid about $13.95 for Baby Hoot. Owls seemed to fit in with fall decor. How could I not bring him home? He was fall colored, he was cheap at $2.00, and he was vintage. The little owl creamer is marked copyright Otagiri 1981. That is two owls now. 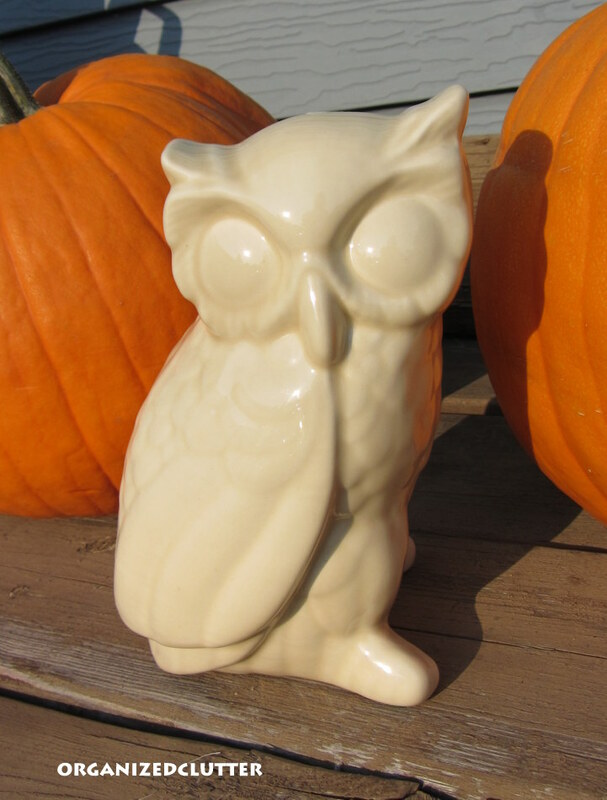 Then I spotted a white bisque unmarked owl for $3.00 at the same consignment shop. This is not the original condition. 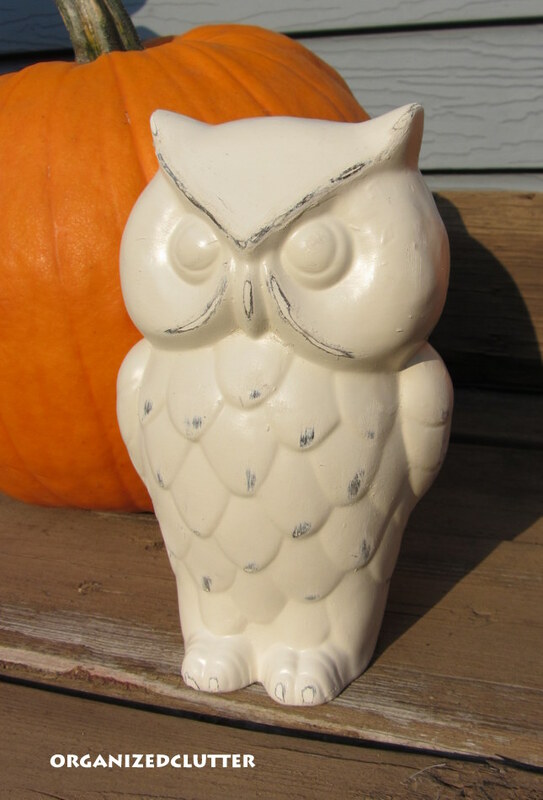 I painted the owl dark brown and then spray painted it heirloom white. 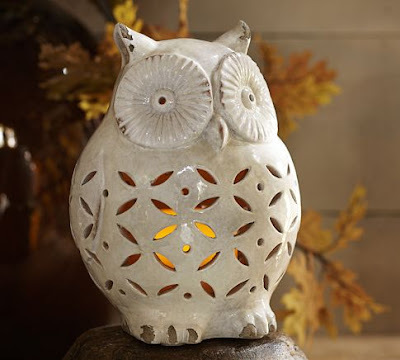 I thought I could make it look like the Pottery Barn lantern owl. I would sand the edges a little, and it would look something like this. Two problems developed during this Pottery Barn owl copycat experiment. The newly spray painted owl blew over outside onto freshly mowed grass and dried that way, and the brown also came off when I sanded the white. I have abandoned my plans to transform it into the Pottery Barn look owl. The owl now has a glossy marigold spray paint finish. You will see more of him soon. That's three owls, and I guess I have a collection. 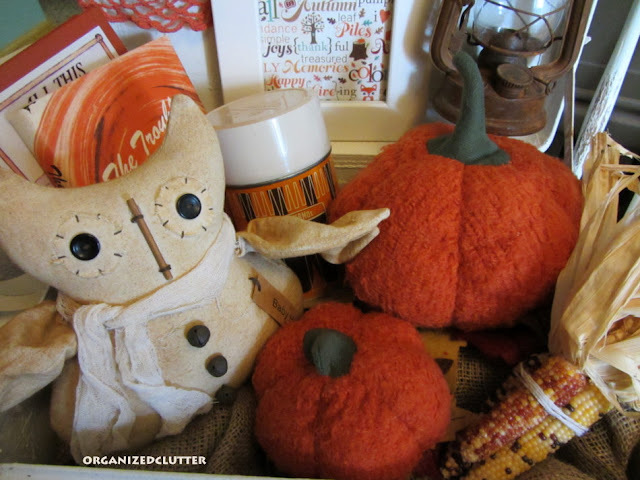 Then while at a local drug store, I spotted this little orange owl and thought that it was the perfect size for my kitchen shadow box. It holds a votive candle. In my case, a flameless votive. This little owl was $10.95. That's four owls. Yesterday, I encountered three more owls at a consignment shop. 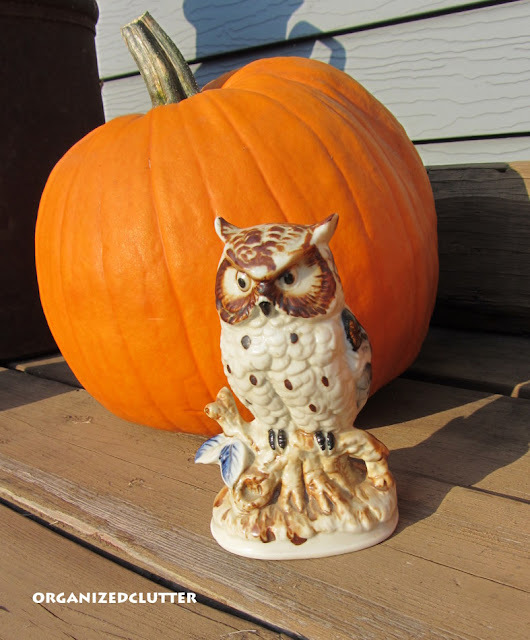 This owl figurine is by National Pottery, Canada. I think its vintage. It was only $3.00. Now I have five owls. This Enesco Japan vintage owl for $2.00. Now I have six owls. 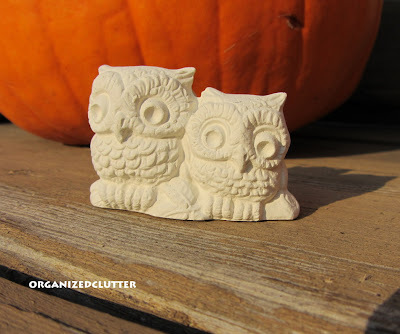 And then there were these little ceramic owls in white bisque for 50 cents. They are being spray painted gold too and will likely go to the kitchen shadow box. 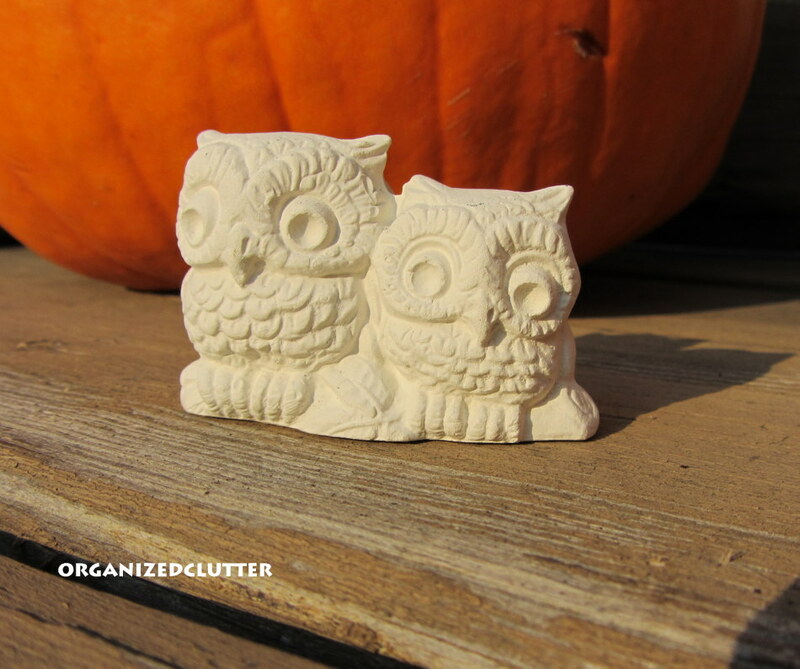 That's seven owls (eight, if you count this figurine as two owls), and that's all of them. I kind of surprised myself with this new owl collection that was amassed in the last month! What a cute collection! I never thought I even liked owls, but the more I see them, the more I like them. I have a few myself now, my daughter loves them. Funny how everything comes back around. You have a great collection of owls...they are all very cute. Thanks for sharing the photos! Have a blessed day. Your collection continues to grow. I had a collection in the 70/80 era. I even made one of those macrama owls. I love the owls now. They are so cute. I like owls from a distance. I love how they look at you. I have an owl like your first one.....I gotta remember to post about him.....I don't think I have any others....other than on paper. I had that same macrama owl in the 80's. I have noticed Owl's every where also, even my 13 year old granddaughter loves them. You have a nice collection now. I remember those macrame wall hangings and wishing I knew how to make them! And I never thought I'd like owls after the 70's, but I bought my granddaughter a cute owly outfit the other day. Does that count? You found some pretty cute owls! I like the little creamer. Cute owls! I too not only remember the macrame owls, but I made one! And it looked similiar to that one. Have a great week! Oh that's funny! 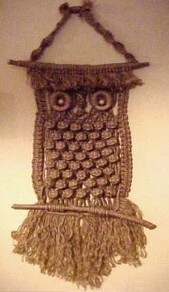 I made one of those macrame owls back in the 70's- along with a bunch of hanging planters too! I just bought an owl yesterday! What a hoot!! LOL... you have some cute ones! I love each and every one of your owls! I was never much of a bird or owl person, but my oldest is so passionate about them that it has rubbed off on all of us. In addition to his large collection in his room we have them scattered all over our house. 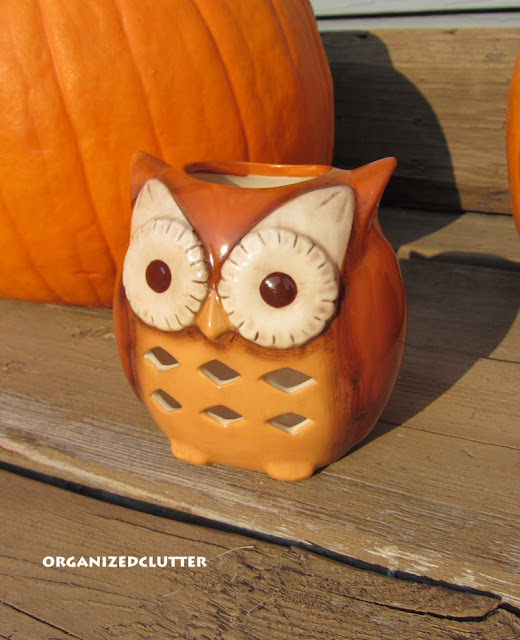 They are perfect for Halloween and fall decor. I think you have a charming group living at your place. Great finds! Hi~I'm visiting you from Mrs. Olson's. The yellow owl caught my eye. I collect owls as well. Mine are not vintage like some of yours. I love your collection. It's funny how a collection can start, isn't it?? What an amazing collection you've amassed in such a short time! I love everyone of your owls. My daughter collects owls, too, and I just know she'll be envious when she sees yours. 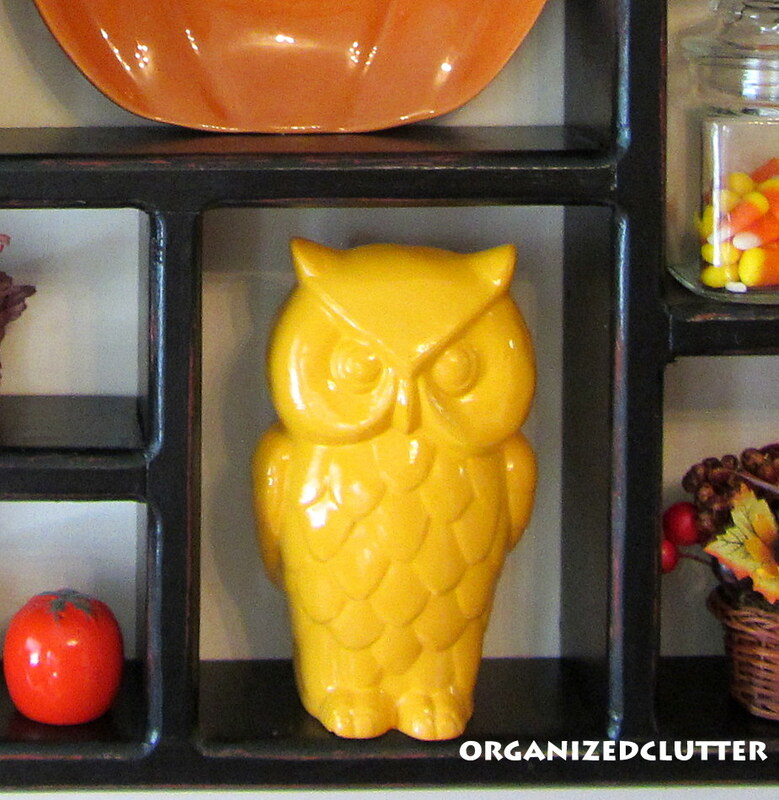 You have such a fun collection of owls and they do fit into the fall decor perfectly. Everything looks wonderful Carlene! Thank you for sharing your sweet owls with us at TTF this week! Cute collection Carlene. You have outdone my in the owl category for sure. They are all so fun! 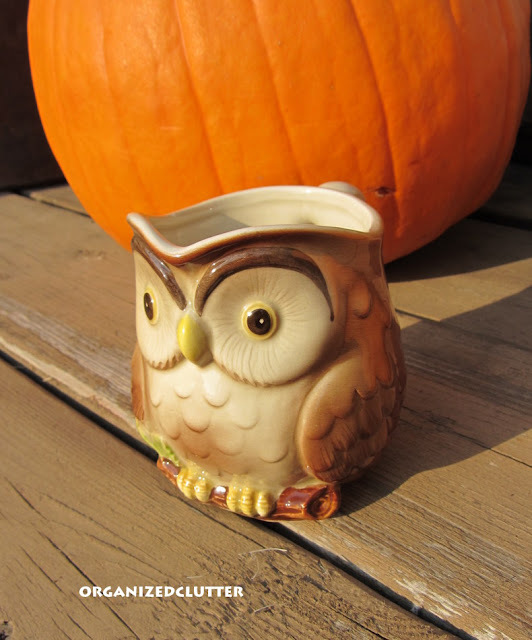 Last summer I bought a cute owl sugar and creamer and S & P set. I gave it to my youngest daughter. Because they are going to Spain soon she has it packed up. Thinkin I need to borrow it back. lol! I didn't do the owl thing in the 70's, but they have grown on me. Thanks for sharing your cuties with Share Your Cup. Love your collection. I think it's so funny how each of us now have a collection!